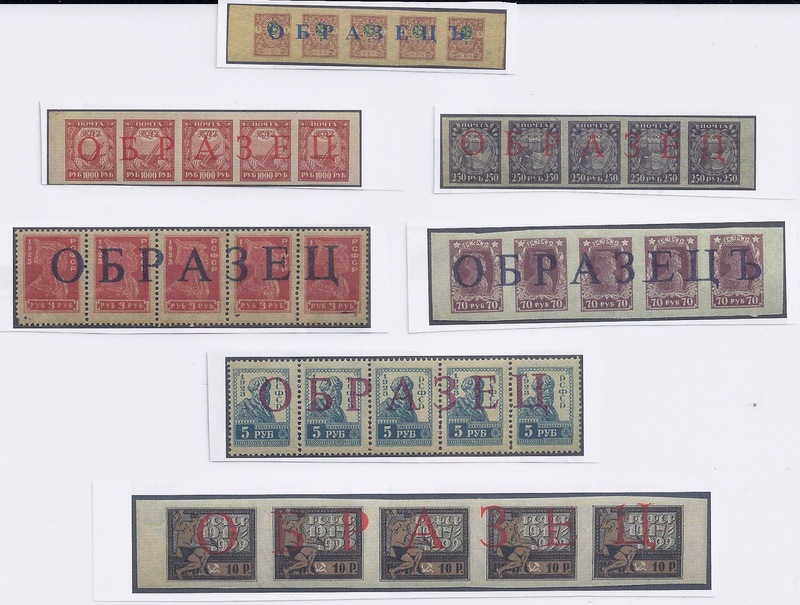 Trevor Pateman's Philately Blog: Russia OBRAZETS overprints: Genuine or Forged? Russia OBRAZETS overprints: Genuine or Forged? Russian OBRAZETS [Specimen] overprints are usually attractive, whether Imperial or Soviet. They are characteristically bold and often printed in a striking vermilion ink. They are not rare and on some issues - for example, Imperial War Charities - they are really quite common. But I always have the feeling that in Auctions, they are far too common and I suspect some of being fakes. Today, I saw something which made me think that I was looking at fakes. Browsing an auction catalogue I saw a strip of stamps with OBRAZETS in blue. The stamps were rouble value Denikins. I show the strip below. Now, in twenty years I have never seen Specimen overprints on Denikins and I didn't know they existed. So I was a bit suspicious of this strip. Then, in the same catalogue, I noticed some Soviet strips with OBRAZETS overprints, though the colours seemed a bit odd. See below. Then I noticed something that these strips have in common and which I have never noticed when looking at genuine OBRAZETS strips. None of these strips has the overprint perfectly horizontal. They are all at a small angle, up or down. This makes me suspicious. First, that they all have this feature. Second, that normally such overprints are applied with great care. And, third, I can easily imagine someone feeding strips into a printer and finding it difficult to keep them exactly straight to take the digital overprint. As a result of thinking like this, I won't be bidding for any of these strips.